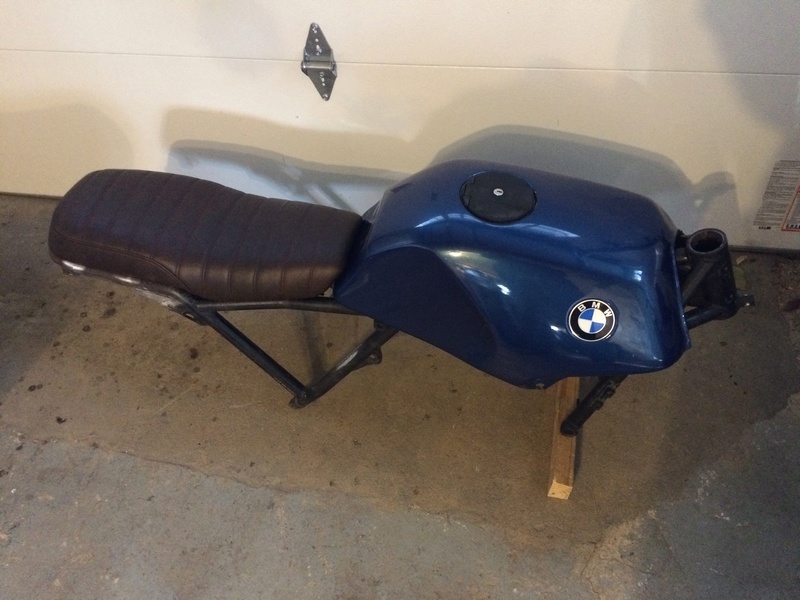 K100-forum.com » Your own renovation / customization » The Rejuvenation of "Alda"
I foolishly started tearing into Alda after I bought her ($800 USD) a couple weeks ago before I had taken any photos. Thus, I can't show you what she looked like before. 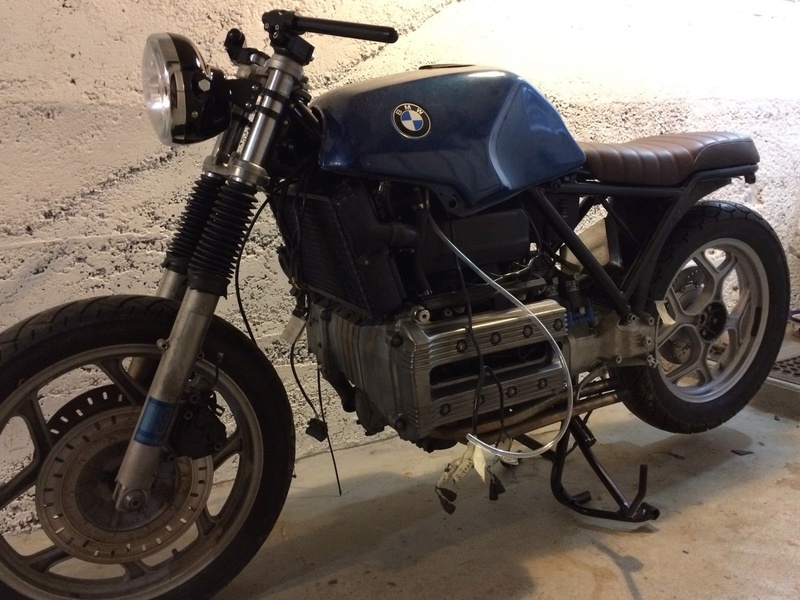 Imagine, though, a 1985 K100RT in caribic blue, with bashed mirrors and fairing, broken shifter lever, broken rear master cylinder, and a couple years of sitting outside. Now, add an enormous king and queen seat and an enormous top rack, and you've pretty much got the picture. Bike will be getting a mild (read: modestly priced) makeover to something a little leaner, a little sportier, and a little sexier. Not crazy about it, but I think it will look better once everything is back together and the new dark brown grips are on. Maybe down the road I'll part with the cash for the one I wanted. As you can see, in addition to reattaching the tail loop, I also nipped the tubes a few centimeters aft of the cross-member and bent them in slightly to allow a better fit. I'd like to get Alda off to the powder coater on Monday or Tuesday. Any advice on the metalic epoxy to improve the cosmetics of the joints -- or am I being ridiculous in the first place. Should be easy enough, but if anyone has plans/pattern drawn up that I can scale and print to size, I'd welcome that. 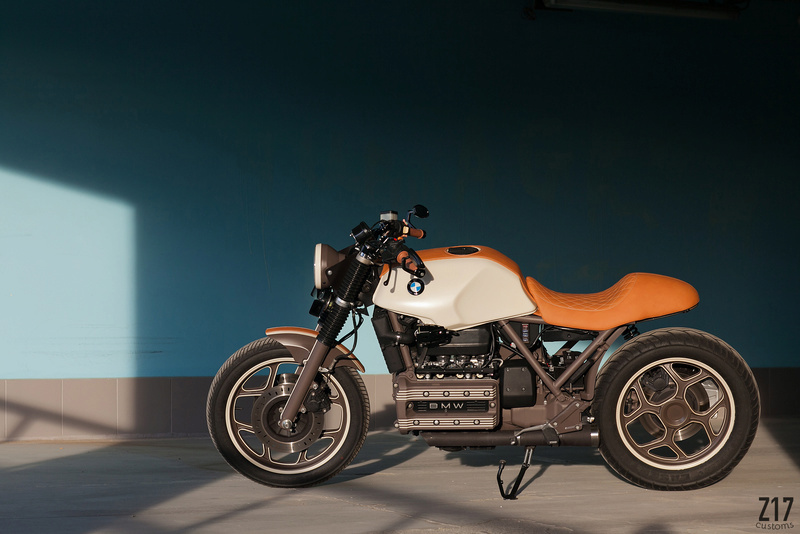 Looks like fun, remember the K75 I saw in Italy?? 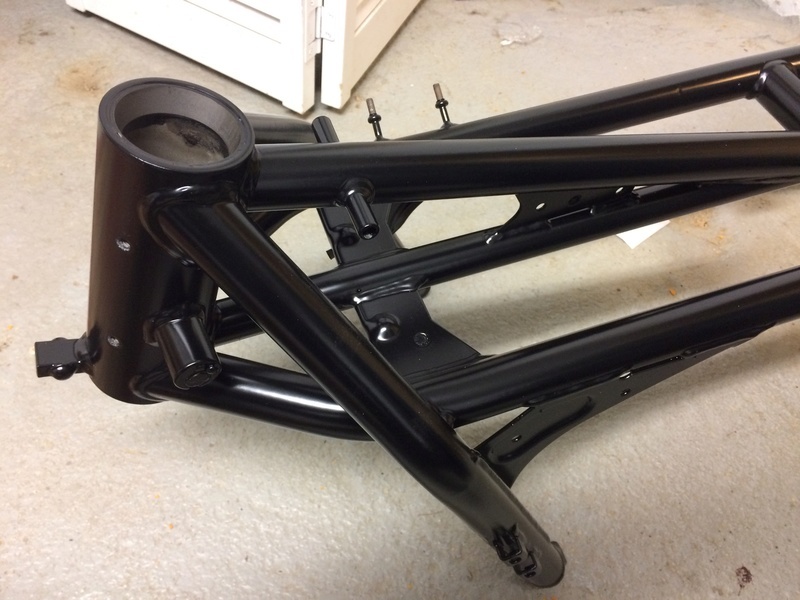 Last time I posted, pretty much the entire bike, except engine, was apart so the frame could be powder coated. Frame is back from Mountain Top, here in central Pennsylvania, and looks pretty good. I've since reassembled most of the bike and I'm kinda looking at her to see whether I like it. I'm not married to the clip ons -- could go with a flatter bar on the original clamps. I'm thinking Koso RX2 GP for gauges. I haven't decided on turn indicators, but leaning toward Motogadget M-Blaze. Depending on handlebars, may need new reservoir. 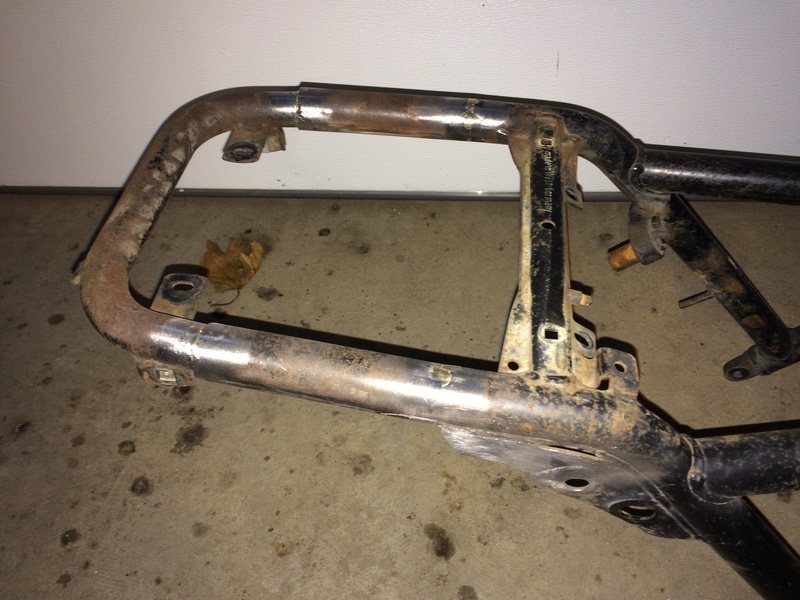 I'll make setbacks, but I'll probably reinstall the original footpeg plates and pegs at least until I can get the bike inspected. So, here's a couple pics (sorry about the quality - best I could get). I welcome your comments and criticism. The rear brake disc looks not solid, is it an upgrade? Yeah, Olaf, that's a brand new stainless steel, floating disc from EBC. Old one was pretty well shot. I understand that regular old steel may have better stopping power than SS, but being drilled is an improvement and I don't like to see the rust. Another thing that might be shot is the rear suspension. At the very least, it needs to be reconditioned, as there's some rust coming through on the spring and the big rubber bush is deteriorated. The unit is a Koni. I don't have any idea if it's worth rebuilding, or if I should just get a new unit altogether. Any advice on that? The early Ks had perforated discs but they were recalled and replaced under warranty with solid discs due to cracking issues. Keep an eye out but it may possibly be less of an issue due to the different riding configuration. I use rear brake a lot and it gets hot. Rear suspension try YSS units, they do some good ones as in Y or Z series. I have an IKON on the LT but decided to not rebuild it on cost grounds. YSS have 2 year warranty. 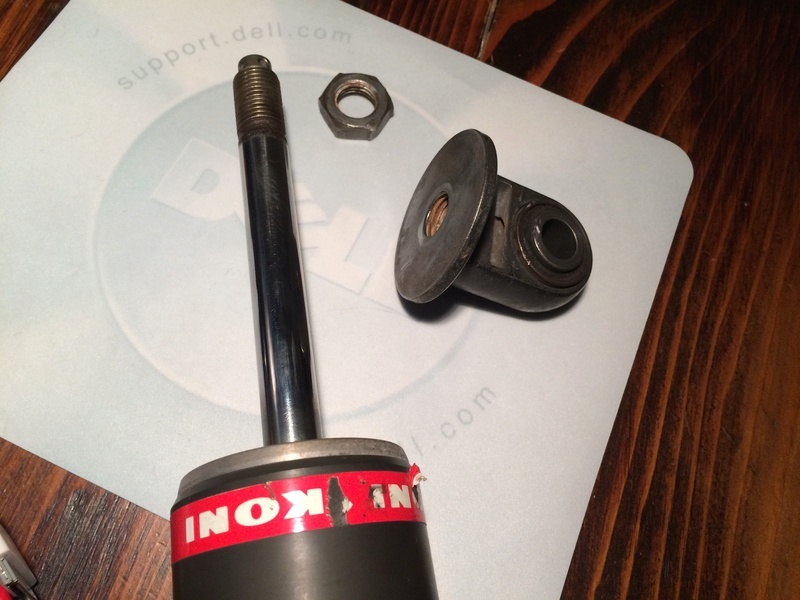 If the shock is a genuine KONI and not an IKON then it can be reconditioned and at a quite reasonable cost. 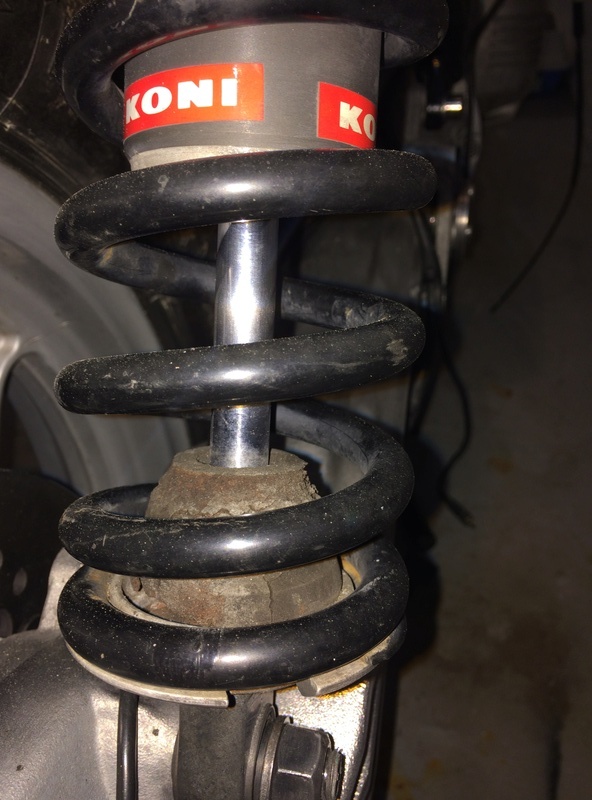 There were some KONI shocks produced in Australia by IKON before they released the IKON brand and they are said to be non rebuildable but as RAD shocks in Brisbane said "there is no such thing as a non rebuildable shock". 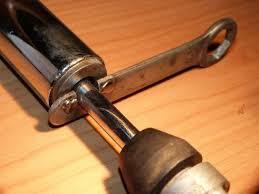 If the hard chrome bore is worn out it may be that it is so expensive as to be not worthwhile but they can be done. I have the drilled floating rear disc from EBC and I could not ask for better. 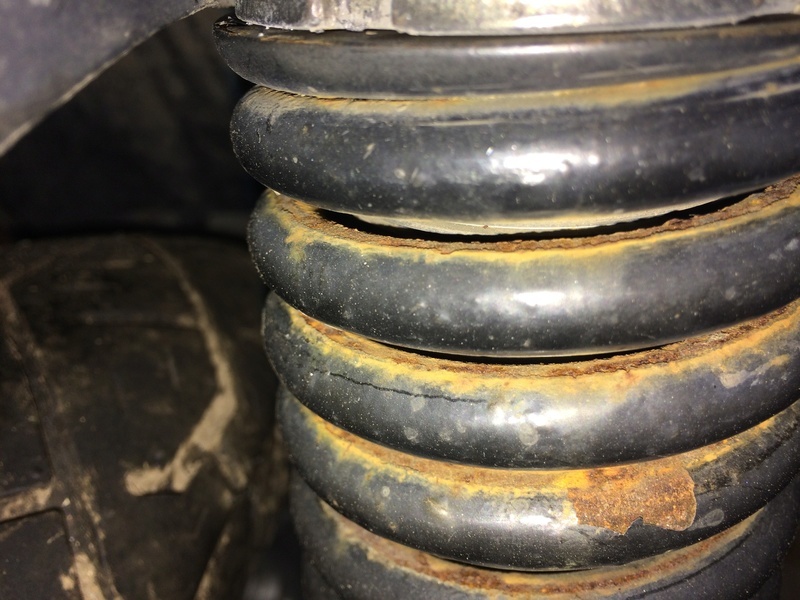 I was quoted over €500 locally to sort out he rear shock and decided against it. As RickG says it can be done but there were a lot of other options. I think it was Motorworks offered a brand new Hagon shock for less money than someone locally wanted to sell me a used one for. The RAM unit is a nice one, all depends on how much you want to spend. Cheapest you will find is the YSS brand new. Motorbike Mike has also gone this route. I now have 15,000 miles on mine since March and happy with it. @RicK G wrote: If the shock is a genuine KONI and not an IKON then it can be reconditioned and at a quite reasonable cost. Probably not economic to send to Oz, but surely there'd be someone over on your side of the ocean that could do it? I have a Realm shock on one of my Ks, and am very happy with it. Another vote for Ramshok (Realm) here but it may be cheaper to buy a YSS from a US supplier. Matter of fact I have just ordered a RAM SHOX for my K1100LT. Thanks for the ideas on the shock, all. I'm inclined to rebuild, if the shock was okay to begin with. It's a true Koni shock. The number stamped on the top is 9312 KONI 30141009 KBA-90279. The spring, uncompressed, is about 11 inches long. Internal opening is between 2-1/4 to 2-1/2 inches. Outer diameter is about 3 inches. Here's a few pics. 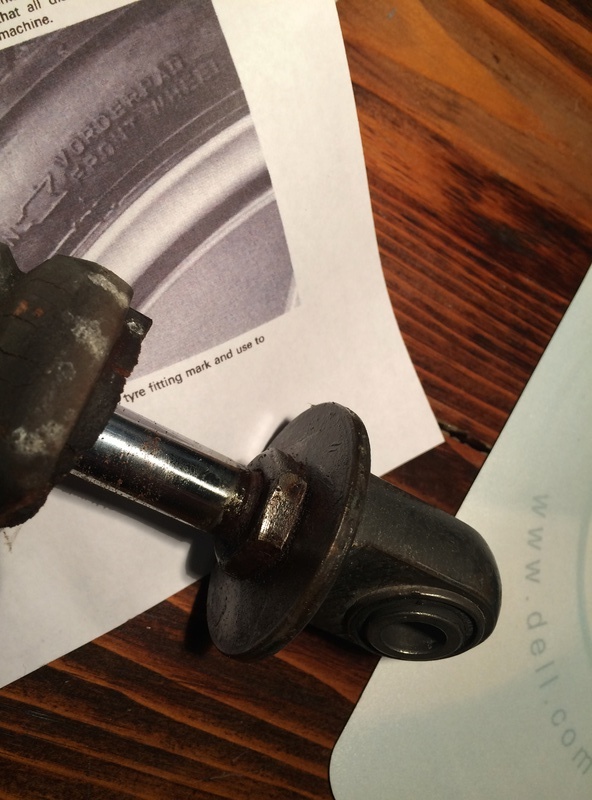 Other than some rust on the nut, the shock looks to be in decent shape. The chrome on the shaft looks good. I'm assuming that I can find a rubber bush/bumper to replace the badly deteriorated one and a new spring. I suppose that some people would salvage the spring, but my guess is that would be an awful lot of effort, and perhaps more cost than buying new, anyway. So, can anyone tell me if this was a decent shock when new and remains a reasonable choice today? Also, if (and only if) I were to buy a new shock, can anyone tell me whether it would be stupid to buy one about an inch longer? I'm 6'-5" (or at least I used to be), so a longer shock would make the saddle just a bit higher; and I also think it would look better. I can't imagine there'd be any significant danger in minimally changing the geometry, but I'll be interested for comment. They don't come much better than a KONI. If there is no oil leaking and the damping is still working then put a new bump stop and use it, it probably is still OK. I have a pair of 32 year old Konis on my z1300 Kawasaki and they are still working well. What is the eye to eye length of your shock? What is the stroke? I ask because in the photos, it appears there is not a lot of rod showing. 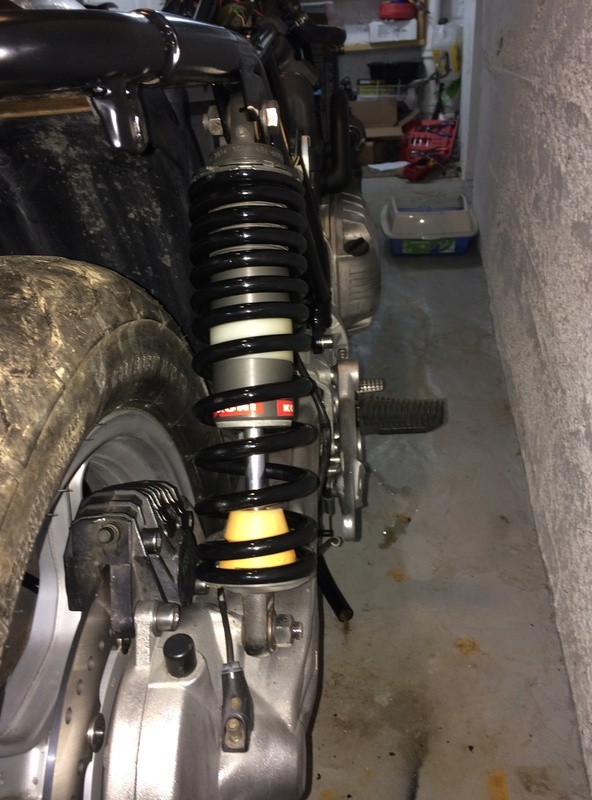 If you decide to use the shock, I would think hard before spending the $80+ for a new spring. As long as the spring rate is good, I would spend a couple bucks on a gallon of white vinegar. Soak the spring in it for a day or so, rinse well, scuff with grey Scotchbrite and hit it with a rust converting primer followed by a couple coats of rattle can paint. Eye to eye is 350mm. There's 60mm of shaft exposed and the polyurethane bumper is another 30. I'll give the vinegar and rattle cans a shot. If I'm not riding over curbs, do I really need the bumper (215lbs or about 100kg). Yes you do need the bump stop. They may compress down to 2-3mm on a really big bump but you still need them. 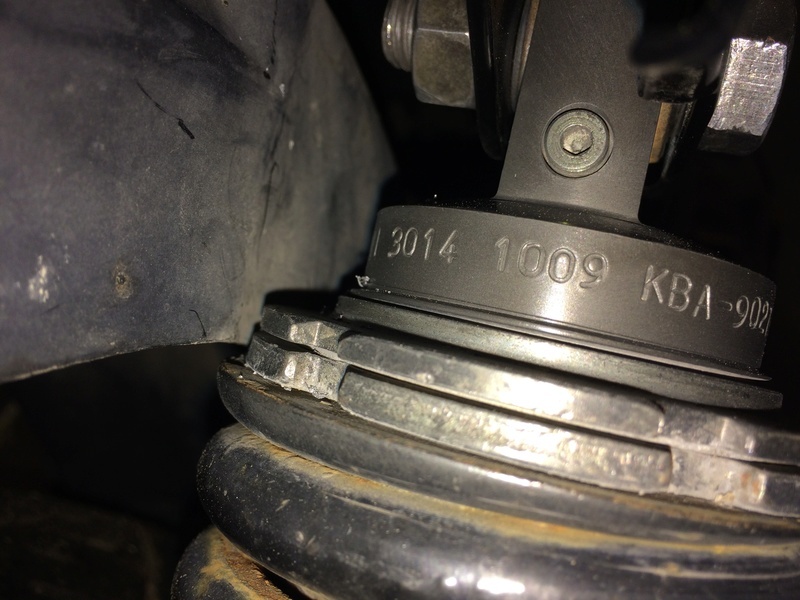 @92KK 84WW Olaf wrote: I was quoted over €500 locally to sort out he rear shock and decided against it. As RickG says it can be done but there were a lot of other options. I think it was Motorworks offered a brand new Hagon shock for less money than someone locally wanted to sell me a used one for. The RAM unit is a nice one, all depends on how much you want to spend. Cheapest you will find is the YSS brand new. Motorbike Mike has also gone this route. I now have 15,000 miles on mine since March and happy with it. That's correct Olaf, I did buy a YSS for my K11LT. It's quite firm on the go but on inspection seems well made. If I'd had a genuine Koni unit I wouldn't think twice about getting it reconditioned, they were a great unit. As for IKON, they're not the same quality as Koni. 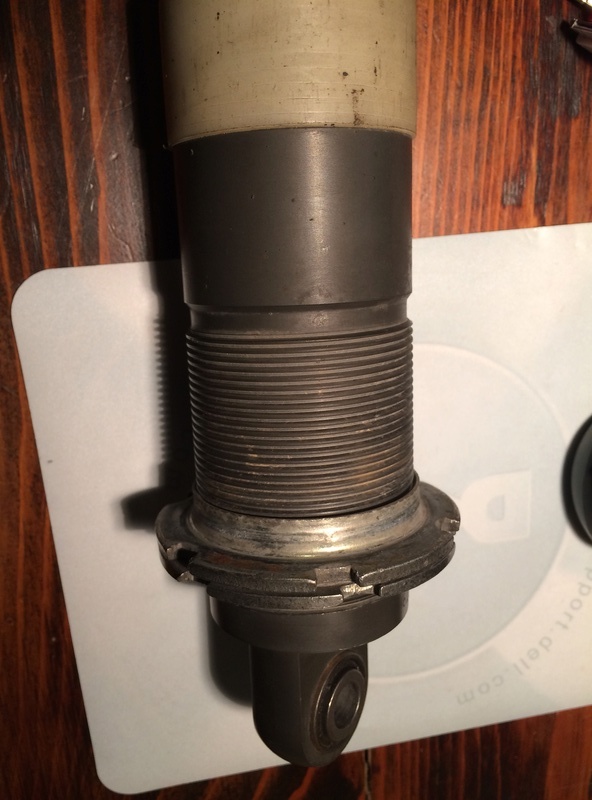 I had a pair on a Harley Flat Tracker I built some years back and the one of the two pegs that are spot welded to the shock body to support the preload adjuster broke off-not at all safe! It was replaced by the supplier but I never felt confident riding the bike after that. I also tried a set of Hagon shocks on the same bike and forgive the pun-SHOCKING! i wouldn't waste my money on them. I run a Wilbers remote reservoir on my Flying Brick which seems well up to the job. It was ordered for a Paralever rear end but as the Mono rear end is 40mm shorter I use it in that swing arm. Obviously it's over length but it gets the back in the air putting more weight on the front and does the trick-I know it may shorten the life of the shaft! Lots of possibilities to consider FreyZI. Go on, rebuild the Koni! If I did have a genuine Koni I would have rebuilt it too. Definitely one of the better options. I do love that K......and yes getting the front to drop in faster is a good modification. 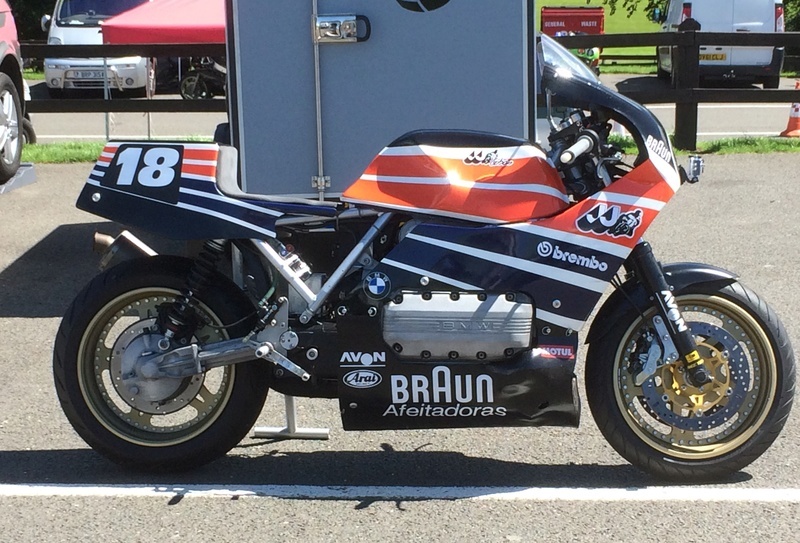 But for touring weight on the back is good provided you can still get the bike to drop into tight corners and Ks seem to do that quite well on a decent rear shock if you use the rear brake quite a bit. Many years back a friend who raced Yamahas but has since passed away always said that you only need enough weight on the back to get the power down and stop the back passing you out on the corners. I think his Yamahas were about half the weight of a street K.
All my K's have the forks up through the yokes/triple clamps until they just about touch the handlebars inc my1100LT. @Motorbike Mike wrote: All my K's have the forks up through the yokes/triple clamps until they just about touch the handlebars inc my1100LT. I would not have expected otherwise. Mine will be too after the next job. Forks off my spares RS will be going on the RT. Before anyone asks they are both 1984 bikes. @RicK G wrote: They don't come much better than a KONI. If there is no oil leaking and the damping is still working then put a new bump stop and use it, it probably is still OK. I have a pair of 32 year old Konis on my z1300 Kawasaki and they are still working well. Thanks for the recommendation, Rick. I have a Koni among my spares that needs a rebuild. I'll send it up to RAD soon, following your advice from another thread. I have RAM shocks on both my LTs and am happy with them. I blew the seal on Gretels, just before her annual MoT inspection - but didn't notice until it failed the inspection (doh!). When I removed it from the bike, it was obvious where the fault was - the piston had a bad patch of corrosion which had torn the seal. The spring was also quite corroded (looked like the one in FreyZi's picture). I was surprised how badly it had corroded as it wasn't that old (I think the corrosion pre-dated my ownership). Anyway, I spoke to the guys at Realm Engineering (very helpful). They used to do a replacement seal kit, but I think they have had too many people making a mess of the replacement so prefer to do the overhaul themselves. I sent my RAM shock back to them and it came back very quickly with new spring, new piston, new seals etc. - in fact pretty much new everything apart from the aluminium casing. The overhaul cost me about £90 (about ⅓ of the cost of a new RAM shock) and it was as good as new. If you do opt for a RAM shock, rather than rebuilding you Koni, talk to the guys at Realm Engineering and they will build a shock that suits you based on your weight and riding conditions/style. They do a standard length shock and one that is 1" longer. Okay, so I decided to rebuild the Koni. The spring is drying. Unfortunately, I can't seem to get the shock apart to replace the bumper. Before I break the thing, how does it come apart? My assumption is that the nut pictured is backed up to the end, locking it on. Tried penetrating oil and heat, with no success. If I put much more elbow grease on the thing, I'm going to bugger something up. Am I right in assuming that I need to move that nut? Is it normally threaded? If you aren't sure get someone who does know but that shaft looks to be pitted with rust and will need re-chroming. So, you'll see that I've gotten my Koni shock apart. I'm not sure why, but I was trying to back the nut off first and then loosen up the bottom end. When I changed that plan and put the nut in the vise and grabbed the bottom end instead with a 12" adjustable wrench -- viola -- the end came off without much ado. (Hence, my "doh" moment. Well, these happen from time to time -- and I'm not even going to share the one from last week). I was worried that the nut still wouldn't budge, but it did come off. I polished the pieces up a bit for the photo. Rick, what appeared to be rust/pitting in the earlier photo was actually the polyurethane bumper. The outside of the bumper was so deteriorated that it crumbled on touch. The only place there's any corrosion is just above the nut and that will be covered by the new bumper. Looks as though the 38mm bumper for 14mm shaft is the perfect replacement; but I still haven't figured out which model shock I actually have. This one has 2-3 inches of thread at the top and two big rings that are turned to increase or decrease preload. I won't need it to affect the repair, but if anybody has an idea what model this is, I'd be pleased to know. 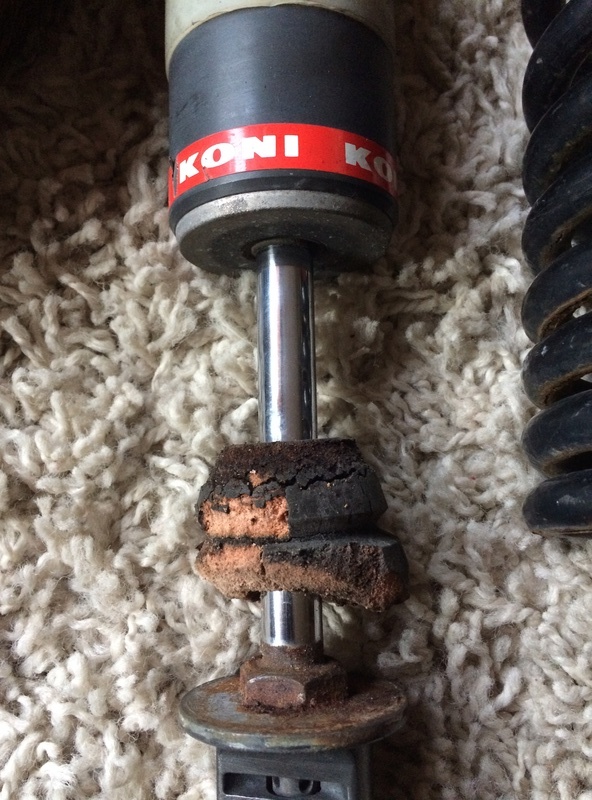 I haven't seen anything close in my Google image search for vintage Koni mono shocks. Meanwhile, there's already been some discussion of BMW parts price gouging and I was dismayed to see the same on other manufacturers' parts used by BMW. Case in point, I need new Brembo rear brake caliper dust seals. I haven't yet found a source that sells just the dust seals without the whole kit (seals, o-rings, and caliper bolts), which is 38.28 USD per BMW pricing. 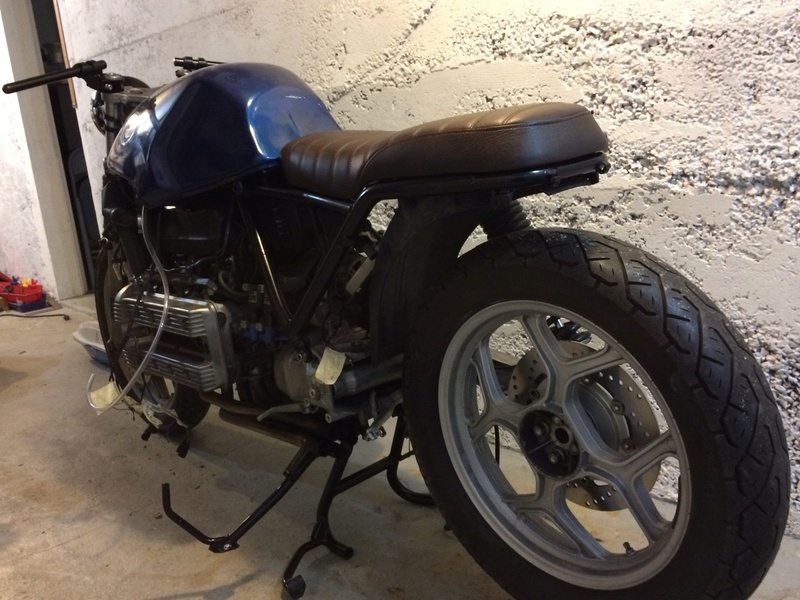 This seemed steep to me, as last year I rebuilt the Brembo F08s on the Moto Guzzi G5 project. Looking back, I overpaid at $16.44 for the same exact kit, which I found today at oppracing.com for $8.78. I understand making a few bucks on parts, but a $30 mark up on a sub $10 part is outrageous, particularly when the parts are widely available and still manufactured. Glad there's a robust aftermarket for Bimmers. Oh, I also encountered a potentially significant problem with the handlebars. The left clip on's pinch bolt mounting doesn't allow clearance for clutch switch wire which exits the control housing fairly close to the bar. Easy solution: scrap the clip-ons (my back would thank me) and go with a flatter bar. 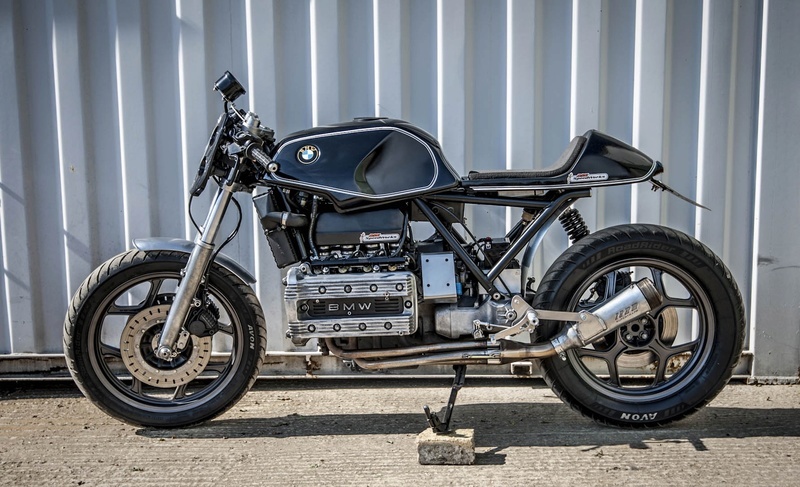 That would give me a look closer to a brat bike than a cafe, which is okay with me. I had already foreseen complaints from (ahem) purists, that the style improperly drew on both distinct forms. However, I'm up for other improvisations to salvage the clip-ons. I'll follow up with a photo of that problem tomorrow. The price gouging with their cars is even worse a new water pump for the 3.0lt V8 is close to $600 but from Pelican parts in Harbor city its $89 plus freight and getting it with a heap of other parts makes the freight about $10 to Oz. I can't comment on the Koni shock, but I have noticed that BMW North America has been doing price increases about every 8-9 months. Some of these increases are in the 5-8% range. Together with the parts that are increasingly becoming unavailable makes me wonder if the powers that be are phasing out support for the classic K bikes. One of the things I have observed in reading old threads is the shocking difference in parts prices over the past 6-12 years. Considering that price inflation has been running around 2% it's hard to understand why prices of some parts have increased by 40% or more over that period. Thanks, all, for the advice on the Koni shock. It's back together now and on the bike. Paint looks okay, just don't look too close. I decided to give the clip-ons a try. Pulled them out of their pinch mounts just a bit to get clearance. Result is handlebar spread is a bit wider (more comfortable?). 4 LED bar end indicators and resistors. The rear pair will mount to the vertical tabs on the tail loop. The front pair I will install on the headlamp mounts, which conveniently have a hold to receive an 8mm bolt. Still need tail lamp. 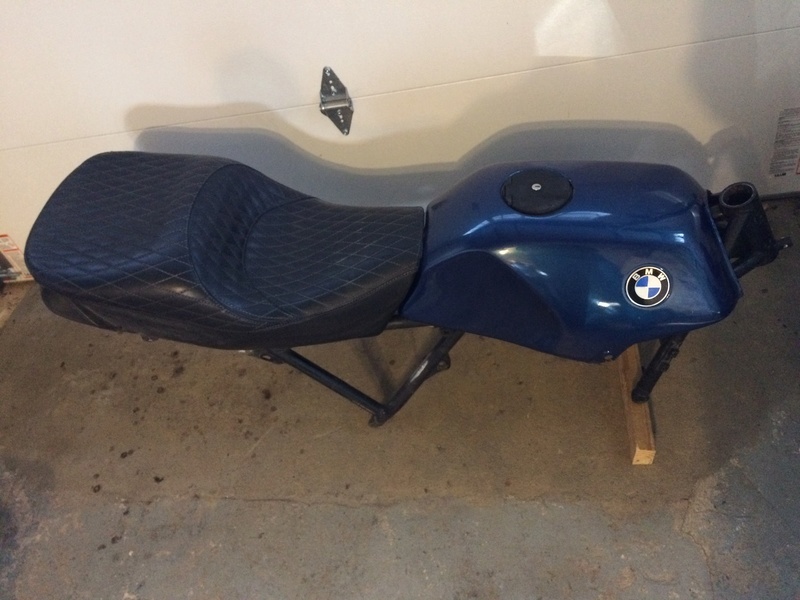 This will be, I believe, a round jobby, maybe 3" diameter or so, and will be installed on the tail loop where the mud guard was previously attached, via a custom mount I'll have to fabricate. Gauges. Still thinking Koso RX2 GP, though I haven't pulled the trigger on that purchase, yet. Key/ignition. Plan was to drill out one of the handlebar mounting holes on the top triple tree to 30mm and insert there. Unfortunately, the bit I ordered turned out to be not suitable for this purpose. A friend is setting up a mill in his basement, so eventually I may be able to have him do this. For now, I'll just have to figure out how and where to mount it inconspicuously. Horns. The stock snail horns are pretty large and I can't figure out where to put them. Maybe I'll try to find something significantly smaller aftermarket. A tiny one/pair could mount to the front of the bottom triple tree. License (number) plate mount/illumination. No room on the tail for license plate, so it's going to have to be mounted to the side, and vertical (if the law allows), presumably off the shock mount on the final drive. I've ordered a pair of little LED license plate lights that (I believe) replace the ordinary bolts for the plate. If they don't work, I'm out 2 USD. Shock. The Koni is on for the moment. I've seen the Ohlins makes damper ends with different lengths. Haven't seen the same in Koni. That would be an easy solution. Because the tail loop was shortened, the rear tube crosses over wheel nearly above the axle. I'd guess I have no more than 4 inches between tire and tube, so that concerns me a bit. At the very least, I'll want to significantly increase the preload. Fuel system. Install new fuel pump and filter. Rear brake. Try to salvage existing master cylinder? Looks pretty crusty. I think that's about the extent of it, other than maintenance: an oil change, transmission oil change, final drive oil fill, coolant fill, and brake fluid fills. Fingers crossed. 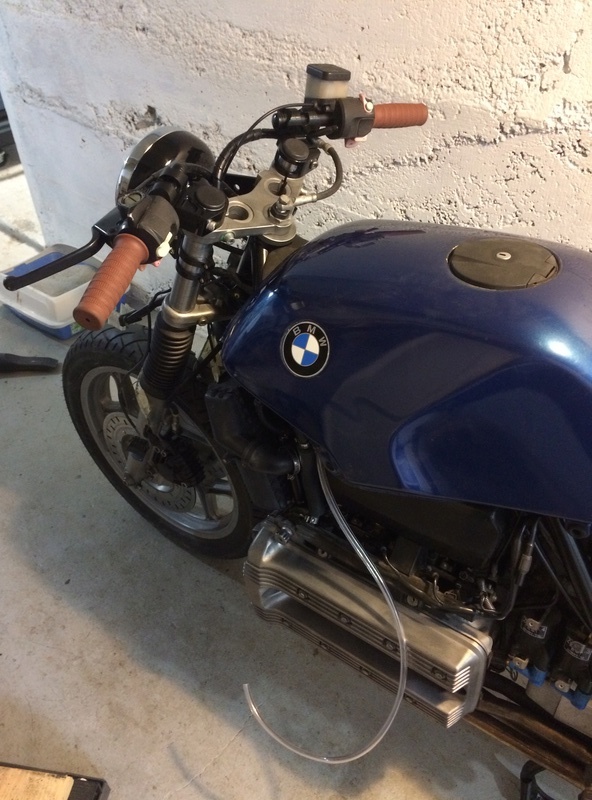 After I get the old girl inspected, I'll work on rearsets and a muffler conversion -- nothing loud, just shorter. I'll have to find another K100 muffler to carve up. Hopefully a welder friend can help me do that. The tank paint is in decent (but nowhere near pristine) condition. Rather than fuss with the paint, I kinda thought the bike would look trick with leather-look full tank cover, like a Bagster (arctic green?). So that's the status of Alda. She's starting to look like a motorcycle again. As always, welcome the comments and advice. 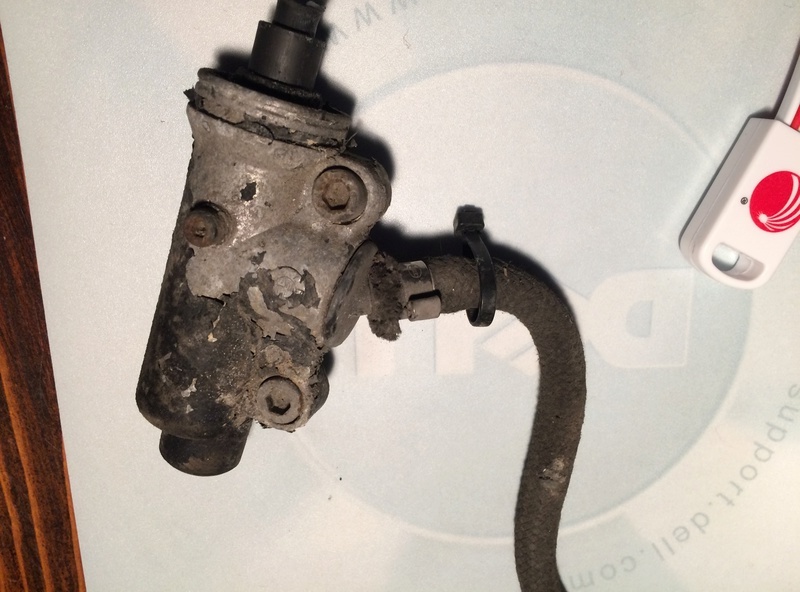 Rear master cylinder: consider overhauling it as they seem to be unique to the K-series. It's dead easy as long as that small allenhead screw comes out because that's what's holding the piston in. Try loosening it; if it doesn't move relatively easily then be prepared to apply heat before you wreck the head. The good thing is that if you do wreck the head of the bolt, there's plenty of room get a pair of vice-grips on. Mine came out easily and it was visually in a far worse state than yours is. I fitted one about 5 years ago to my 1883 vintage K100 and am happy with the result. One of the satisfying things is the shedding of weight and the increase of space and improved access in front of the headstock - makes some tasks in that area much easier. To be provocative (to some) the weight loss is like fitting a LiPo battery in place of a lead/acid or GSM battery. a huge positive difference. Incidentally the Koso unit is well made and reliable. I notice that there are some Koso Chinese knock-offs selling for as little as approx $60. If you go this way, weigh your old speed unit and then the Koso unit and marvel at the weight loss.